Broken bone in your foot? Here's how our doctors treat them. If your foot hurts, and you think you may have broken a bone, by all means, make an appointment with one of our doctors right away. It is better for you to come into our office rather than going to your primary care dr first, as he or she may send you to the hospital for an X-ray. You will then have to drive to the hospital, register, walk to radiology, and have the tech take an X-ray. Then, the radiologist will read it a day or 2 later, then send a report to your PCP. Your doctor will call you with the results after another day, and likely send you to our office anyways as they don't have the means to treat the fracture. Our doctors here at Prairie Path will do a thorough exam, including digital X-rays right here in the office. We will share the X-rays and results with you and if it is a fracture, start the treatment plan right then and there. Our treatment consists of controlling the swelling and controlling the pain as well as helping your body heal. In order for bone to heal, it needs to be immobilized. Why? I explain it to my patients this way: think of it like 2 pieces of paper with glue holding the, together. If it keeps moving, eventually the glue will dry, but it takes a lot longer than if you just hold the 2 pieces in place and let the glue dry. The same thing goes with 2 parts of a broken bone. 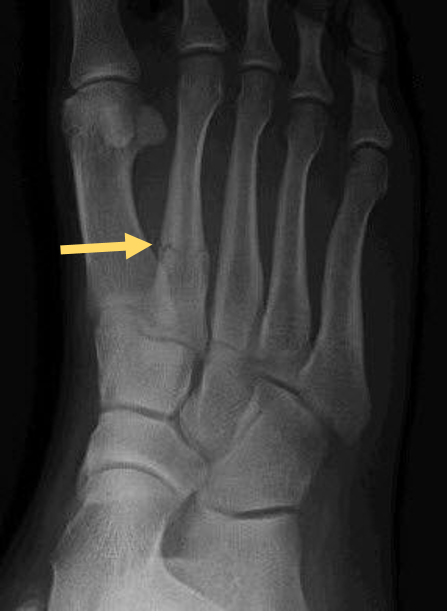 If the foot is immobilized, or held stable, the two broken ends are more likely to heal. You will have less motion, less pain, and faster healing. In most toe fractures, you will be placed on a surgical shoe. It allows you to walk but limits excess movement to the toes. This will decrease pain and lessen healing time. Your broken toe may be taped and splinted to the toe next to it for stability. The most common way to immobilize is with a CAM (controlled ankle movement) walker or walking cast boot. It is pneumatic, which means there are air bladders that can be filled to stabilize the foot within the boot. It also has a curved, or rocker bottom to help when walking. They are usually gray or black, and can be removed under your doctors instruction. In a more serious fracture, your doctor may place you in a below knee fiberglass cast. This means you will have to be on crutches and remain nonweightbearing, and it is evaluated and replaced every 2 weeks. In the most serious fracture, your doctor may recommend surgery. This is rare, but still possible. After surgery, you may be in a CAMP walker walking boot, a half cast called a posterior splint, or a fiberglass below knee cast. Whichever treatment, the most important first step is to make an appointment and have your foot checked. Make an appointment with one of our doctors today.